In today’s society, we are increasingly mobile. According to an article in this year’s New York Times, 3.6 million married Americans were living apart from their spouses and families due to their job, commuting and living in a different city just for work. And the Children’s Rights Council reports that, in 2003, 34 million children had a divorced or separated parent living in a different city. Also, about 66 percent of grandparents have at least one grandchild who lives farther than a day’s drive away (according to AARP). Many if not most of us have a family member living in a different city, state or country. We fly for business, keeping us out of town and away from our families for several days or a week at a time, and many of us do this several times a year, if not once a month. These trends tell me that all of us most likely know someone—a family member, friend or colleague—who lives farther away than we can regularly drive and visit. You may be like me: every one of my family members live in different states due to their careers or desires to live where they are. I have been the typical “road warrior,” spending week after week traveling for business over the years. I have also lived 1,000 miles from my at that time four-year-old daughter, who was moved by her mother after we divorced. I was relegated to a phone call and, as many of us know, a phone call is never enough to stay in touch with our family and friends, especially our children! Through determination, luck or both, I found a remedy to those times when I couldn’t be there in person with my daughter. It’s a solution that may sound futuristic to some of you, but it’s actually very easy and quite affordable—well worth the small investment, in my opinion, to keep in touch with family and friends. Some people call it “virtual visitation,” and the kind that I’m encouraging you to try is basically the same as what the business world calls “video conferencing.” Virtual visitation allowed me to not only hear, but also see my 4-year-old daughter until I relocated to where she lived and I could be closer and help raise her in person. The obvious application is for long-distance dads and dads who travel for work, but it’s also a great benefit for staying close with grandparents. We use video calls when my daughter is with me to communicate with Grandma and Grandpa who live in a different state, 1,500 miles away. Grandparents can use virtual visitation to see and hear their grandchildren more often and of course their own children or other family who, in today’s age, often live farther away than a drive across town. With virtual visitation, we are able to stay in touch more often and see subtle changes that occur with our children and grandchildren. While traveling on business, I have been able to show my daughter the view out my hotel window wherever I was in the world. One time I had a video call with her from a gazebo on the beach in Maui. 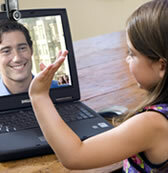 My daughter has been able to see her grandparents, aunts, uncles and cousins far more than before we used video calls. I have also had video calls with many family and friends from places such as Brazil and the wet coast of the Ring of Kerry in Ireland. Most if not all hotels now offer high-speed Internet, as do many coffee shops and eateries that we frequent while traveling. Once you get started, I think you’ll be surprised how easy virtual visitation really is. When I started using video calls over 6 years ago, there were only a few solutions available, but now there are many to choose from. Using a computer is the most common option. Many of us now have laptops for business that we take home with us, and they are perfect for making video calls. There are also video telephones like you might see on a TV show like 24 or Celebrity Apprentice. A computer – Windows or Apple. The video programs will run faster if you have a Duo Core processor. A webcam. There are many different models available, and the camera will make a difference in quality and how much you enjoy the experience. I recommend upper-end Logitech webcams. Video call software. Great options are free, such as Skype, Microsoft Live Messenger, and Logitech Vid (formerly SightSpeed) for Windows, and iChat for Apple. Logitech Vid has a four-location video call option for an additional fee. Microphone. 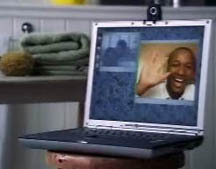 Many webcams have built-in microphones. Headset. This is optional, but can be used with or without a microphone for better sound and video call experience. For a solution that doesn’t involve a computer, video telephones are devices that look, feel and work just like a telephone with the addition of a video screen for the visual portion. One thing to keep in mind is that each side of the call must use the same set-up, hardware and software, as well as high-speed Internet connections. Sorry, but satellite feeds and typical dial-up connections won’t work for virtual visitation. Those are a few of the specifics, and I have more specific information on my websites: www.IntenetVisitation.net and www.VideoCallTips.com. But again, I encourage you to give it a try. Once you’ve tried virtual visitation and you see how easy, inexpensive, and fun it is, you’ll wonder why you didn’t start using it years ago. Give me a video call anytime to test your setup! Michael Gough lives in Austin, Texas, where he enjoys parenting his daughter every other day and enjoys mountain biking, towing her along the bike paths, cooking with her help and being the best father he can be. Michael is the Principal of InternetVisitation.net and the leading expert on virtual visitation. He is responsible or significantly contributed to the first six Electronic Communication Laws for virtual visitation in the United States: UT, WI, TX, FL and in 2009 added IL and NC! In addition, Michael is author of Video Conferencing over IP and Skype Me!, and an information security expert for the State of Texas.